The Trip: Philadelphia to McMurdo Station, Antarctica (about 9,310 miles as the crow flies…but it’s pretty difficult to route on Google Maps ). McMurdo is a U.S. Antarctic research base operated by the National Science Foundation’s U.S. Antarctic Program. It is the largest settlement on the continent –capable of supporting more than 1,200 residents. 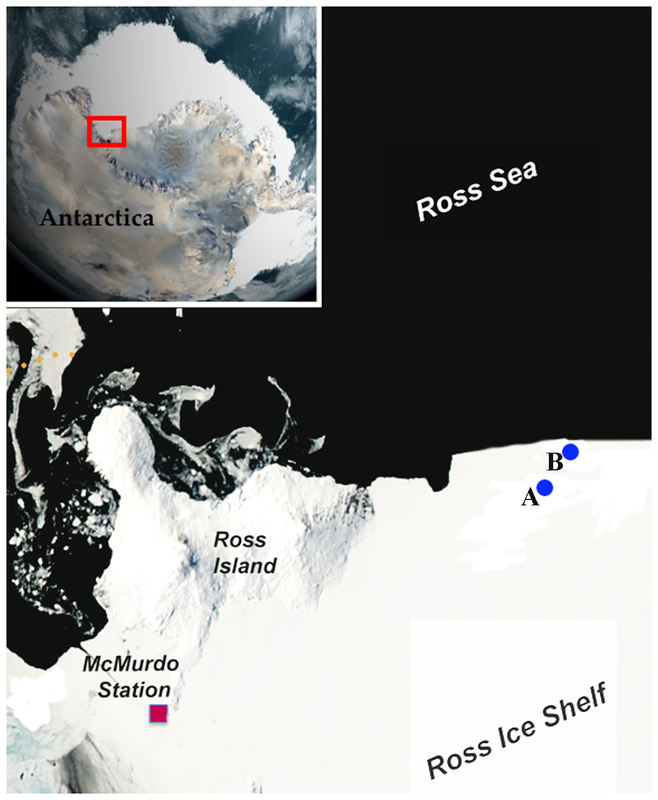 The Research: “Collaborative Research: High-resolution Study of Atmosphere, Ice, and Aerosol Interactions in Coastal Antarctica” is an NSF-funded project focused on real-time testing of size and composition of aerosol particles. Using the sophisticated tools they’re toting along (more on that below), the team will study the interaction between aerosols, the gas phase, sea ice and the snowpack. The snowpack is essentially an atmospheric record frozen in time and ice. It is important to understand how particles interact with gasses to form the snowpack, in order to get a better picture of current and past atmospheric conditions. The ability to study this interaction in real-time will provide new insight into this process and useful data for future teams of Antarctic researchers. Lars Kalnajs, a research scientist from the Laboratory of Atmospheric and Space Physics at the University of Colorado. DeCarlo and Kalnajs did their doctoral research in the same department at Colorado. This is Kalnajs’ sixth trip to Antarctica. Itinerary: Oct. 10 – Dec. 5, 2014. It’s the middle of the high-travel season to Antarctica. The southern hemisphere summer is starting. It brings hundreds of researchers to McMurdo, more than quadrupling its “winter-over” population in a matter of weeks. The research team is planning to avoid this crowd by going earlier in the season next year, during “winfly” –the start of the winter fly season, when the first flights are able to land. Conditions: Average temperature is -2 degrees Fahrenheit. Average snowfall for October is a little over five inches at the station. Transportation: One commercial flight (Philadelphia to New Zealand with a few stops in between), one military transport flight on a C-17 aircraft (from New Zealand to McMurdo, courtesy of Lockheed Martin), one PistenBully transport vehicle (from McMurdo to the field research encampment near the Ross Island region of southern coastal Antarctica). 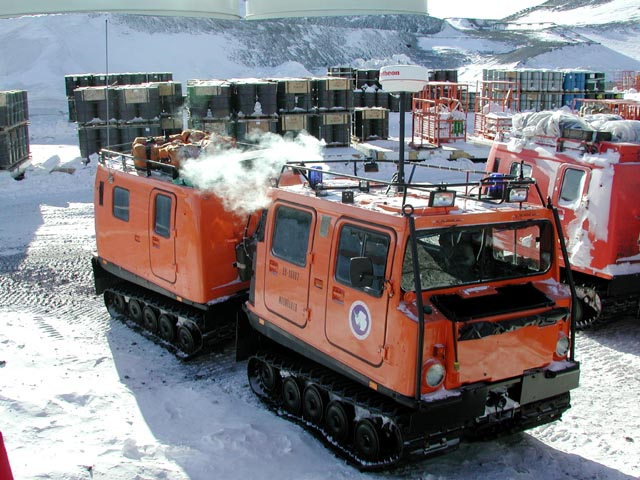 PistenBully transport vehicles, like this one, will take the team from McMurdo Station to their more remote research outpost. Accommodations: Dorm-style housing while on base at McMurdo station. A polar haven shelter with sleeping bags and a lot of hot beverages for relaxing while at the field measurements site. One Aerodyne High Resolutoin Aerosol Mass Spectrometer (AMS) at approximately 700 lbs it’s a big instrument and the centerpiece of their research. The AMS allows for real-time analysis of aerosol particles. DeCarlo helped develop this instrument when he was a graduate student at the University of Colorado. One Brechtel Manufacturing, Inc. Particle-into-Liquid Sampler -recently acquired by DeCarlo – to measure particulate composition. One Brechtel Manufacturing, Inc. Scanning Electrical Mobility Sizer, to measure particle size distributions and calibrate the AMS. Kalnajs will also be bringing instruments to make gas phase measurements of ozone and nitrous oxide. 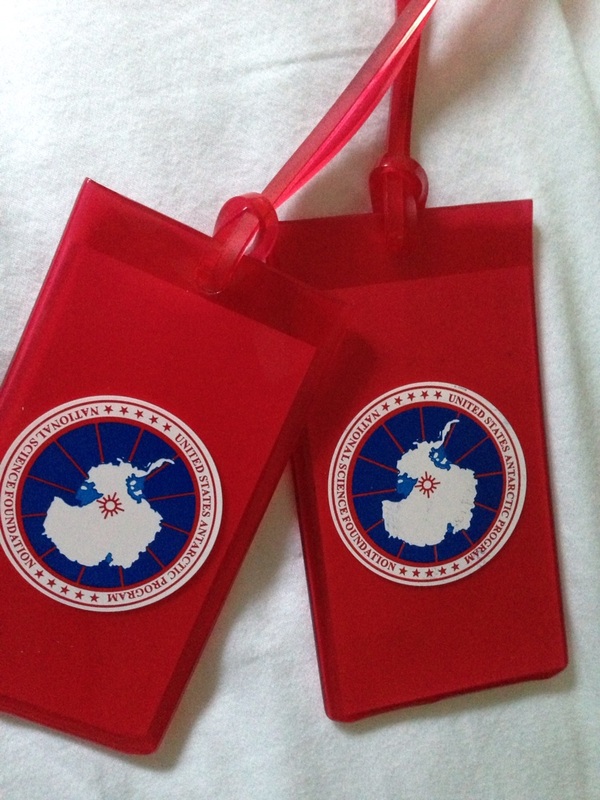 Getting luggage and equipment to Antarctica requires tags, like these, and plenty of planning. Preparation: After several months of packing and shipping, the instrumentation and support equipment (including a lot of spare parts…FedEx doesn’t deliver overnight to McMurdo), the team is getting ready to pack their bags and head out. Extreme cold weather gear is provided by the U.S. Antarctic Program, so coats, boots, and long underwear are covered. Safety is paramount when doing research in polar regions. When the team arrives at McMurdo station they will undergo approximately five days of safety training before they are allowed to leave the base. This includes “happy camper” –a rather sunny nickname for the researchers’ cold weather survival training, which includes spending a night camping outside on base. Follow along: The team will be regularly updating a blog during their trip, you can check in on the group here or visit its facebook page here.